I'm not going to lie to you. Korean pronunciation is hard. For English speakers, especially so. The consonants and vowels of Korean match poorly to those of English, if they even match at all. Many sounds, like the vowel "ㅡ", are completely new to the English ear, while others that seem more familiar, (like the consonants ㅂ, ㅁ, and ㄴ) have idiosyncracies that make them hard to grasp. Other sounds, like the treacherous double consonants ㅃ,ㅉ,ㄸ,ㄲ, and ㅆ are claimed by many (incorrectly) to be impossible to master. Throw the entirely unique 한글 writing system on top of all of this, and many English-speaking learners of Korean feel lost at sea. So what's a learner to do? How can you, I, or anyone else decipher the Korean sound system in a way that allows us to actually learn and pronounce it well? The answer comes in the form of a variety of pronunciation tools, some of which are more helpful and more accurate than others. My goal today is to give you a brief overview of many of these tools, and show you which ones are bad, which ones are good, which ones are better, and which are the best. The most nefarious of all Korean pronunciation aids is known as romanization. Romanization, so called because it converts Korean letters into Roman/Latin letters (that is, the common alphabet of most Western languages, including English), was developed to give Westerners the ability to sound out Korean words without needing to learn the Korean writing system. This is great in a pinch. For example, if you show your non-Korean-speaking friend the romanized version of 김밥 (kimbap), they'll say something that kinda, sorta, mostly sounds like the Korean word 김밥. However, give your friend anything more complicated, like the Korean culinary staples jjajangmyeon (짜장면) or tteok-bokki (떡뽁기) and what they will say will sound completely different from how a Korean would say those words. Even if you know a bit of Korean already, romanization can be intensely unreliable. Historically, there have been a variety of competing systems for writing Korean with Latin letters, and that means that even the same word can be written multiple ways, in accordance with which system you are using. That's why even simple, common words like 한글 are sometimes seen as "hangul", "hangeul", "han-geul", or even "hankul". In short, unless you've got nothing else to work with, don't use Romanization to learn to pronounce anything. There are much better resources out there which actually make use of the fundamental fabric of pronunciation: sounds! If we completely avoid romanization as a pronunciation tool, then we need a place to actually start. We need a good tool that can tell us how to pronounce Korean words reasonably accurately in a moment's notice. Lacking anything better, I would begin with a series of tools known as either Machine Translators or Text-to-Speech tools. These resources use a computerized (non-human) voice to simulate spoken Korean. What you need to do is simply input a Korean word, sentence, or phrase, and then you will be treated to an audio reproduction of what those Korean words sound like when spoken. Of course, if you've ever used something like Siri, or Cortana, or any other of the wide variety of virtual assistants that come stock with most handheld technologies nowadays, then you know that these kinds of computerized voices are merely okay. They don't mispronounce much, but they do talk in a way that sounds stilted and unnatural to almost any native speaker. Because of this, I recommend using text-to-speech tools only as a guideline for how a word should be pronounced. Don't attempt to imitate other aspects of what you hear, like the intonation or rhythm of the voice itself. You want to come away with a good understanding of how the word sounds, but you don't want to end up sounding like a robot yourself. The computer-voice-based tools in the last section are helpful because they can give you a reasonably reliable pronunciation of a word at a moment's notice. However, relying on a computerized voice can be problematic; if you can't understand what sounds the voice is making (because it's too robotic, too distorted, etc.) then you can still end up pronouncing words wrong. One way around this is to avoid computerized pronunciation aids at all. In fact, I recommend two tools that can faithfully represent Korean sounds in writing, allowing you to pronounce words reliably even before you hear them spoken aloud. If you are already familiar with how individual 한글 characters (ㄱ, ㄴ, ㄷ, ㄹ, ㅁ, etc.) are pronounced, then phonetic 한글 is a great resource to lean on. Phonetic 한글 is an alternative version of 한글 that represents Korean words exactly as they are pronounced, rather than how they have historically been written. This is necessary because Korean is full of small pronunciation "adjustments" that occur when certain sounds appear next to one another. More often than not, the written 한글 does not show these adjustments, so you can't learn them just by reading the word alone. All of these words are written as they appear on the left, but are actually pronounced as they are appear (in phonetic 한글) on the right. The sound combinations in these words cause pronunciation changes that are not at all obvious to learners, and the phonetic 한글 helps you see them in action. If you want to go even more in-depth with written pronunciation aids, you can do no better than with the International Phonetic Alphabet, or IPA. The IPA is a modified version of the Latin alphabet that is used by linguists to write down languages the way they sound when spoken. It reduces ambiguity by limiting each possible sound of a language to one symbol. Additionally, accent marks and diacritics can be added or left out to represent a word more or less precisely. For non-linguists, the IPA can be immensely complicated to learn. It's not something I would recommend that 99.9% of language learners concern themselves with. However, if you're really dedicated to fine-tuning your Korean pronunciation, then knowing the IPA can help. Just learning the symbols for the consonants and vowels of Korean can help you know exactly how to use your vocal tract (mouth, tongue, teeth, vocal cords, etc.) to pronounce these sounds. 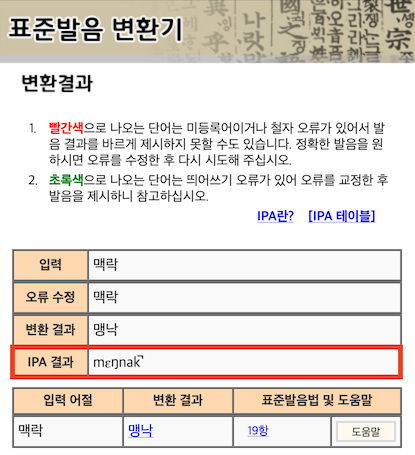 Here's a browser-based tool that can help you convert any 한글 to IPA quickly and easily. Though few pronunciation tools can rival the precision of the IPA, it would be unreasonable of me to expect that many (or any) of you would learn it just to improve your skills. It takes time and effort to learn for what is ultimately a small return on investment. What you want, I'm sure, are results, as quick as you can get them. For that reason, I'm suggesting one more set of resources that I believe are the best and most authentic pronunciation tools, all involving real native-speakers. The quickest, and most authentic pronunciation tool on the market nowadays is a website called Forvo, which markets itself as a "pronunciation dictionary". In short, Forvo is a collection of thousands and thousands of recorded words and phrases from a wide variety of language. If you search for a word on Forvo, it is very likely you will get back a recording of that word as spoken by one or more native speakers. For Korean specifically, Forvo has a database of 63,000 words by over 7,500 native speakers. The last, and perhaps best source of Korean pronunciation help that I can recommend to you is an actual native speaker of Korean. There's nothing better or more helpful than having a native speaker in front of you, presenting them with a word, and having them pronounce it flawlessly back to you. If you do this, you gain additional benefits from actually watching the person pronounce the word. You can see how their jaw moves, how their lips are shaped, and (if you ask nicely, and are not weird about it) where their tongue is placed when they make certain sounds. One word of warning: Native speakers (of any language, not just Korean), are generally not good at using words to explain how to pronounce something. They have the muscle memory to pronounce words perfectly, but usually not the explicit knowledge or vocabulary to be able to explain the mechanics of the mouth accurately. If you currently don't know any native speakers that you can ask for pronunciation help, then I would recommend you find someone online using italki.com or the HelloTalk mobile app. I'll say it one last time. Korean pronunciation is hard. But here's the real truth: hard is not the same thing as impossible. If you want to learn Korean pronunciation, then all you need to do is practice it early and often, with the aid of the right resources. The resources I've listed here are quite comprehensive. They are tools that can be used in a variety of contexts, and adapted to fit many different learning styles. Furthermore, they allow you to become as good at Korean pronunciation as you'd like, depending on which level of depth and skill interests you most. A few years ago, long before I became a member of the Motivate Korean team, Jeremy and Jane created a pronunciation course called Perfect Your Korean Pronunciation. Now, I've tested many Korean pronunciation tools and resources in my time, and I can say with 100% sincerity that Perfect Your Korean Pronunciation is the best Korean pronunciation course available on the market today. Seriously. Prior to going through the course, I had no ability to pronounce double consonants at all. I couldn't even hear them. Now, they give me no trouble. I can hear them and produce them reliably, every single time. All thanks to Jeremy and Jane's hard work and dedication to making Korean pronunciation easy for learners like us. If you'd like to finally crack the code of the Korean sound system, check out Perfect Your Korean Pronunciation today.